is arguably the the most infuluential anti-Christian polemic of all time. Click on the image above to download it as a pdf file. If you would like to see some videos on atheism and its related movements click here or on the picture below. To view more classic works on Atheism and related topics click on the above image or here. 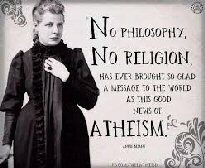 In the nineteenth century Atheism and various related movements that called themselves "agnostics," "humanists," or "rationalists" groups organized themselves along the line of Christian Churches.